NOTICE: Activation key must be used on a valid Steam account, requires internet connection. 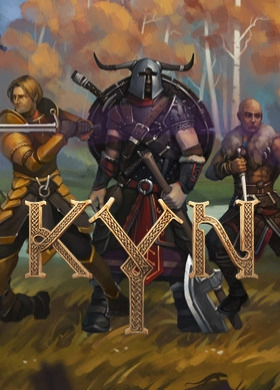 ABOUT THE GAME	In a world where Viking mythology collides with magic, explore the world of KYN in a fast paced role playing strategy game that combines party based combat with exploration and progression. KEY FEATURES A Magical Viking World Brought to Life. Unlock the mysteries of the vast world of KYN … as you explore ancient ruins, lush landscapes and snowy mountains filled with intricate puzzles and plenty of danger! Fight against a variety of intelligent enemies and use your skill and cunning to take out powerful boss enemies! A Hybrid Tactical RPG Meets Hack-n-Slash. This is real time action in a fantastical RPG setting. You will need to leverage the environment to create traps, defend areas or build up special attacks. When tactics are needed, utilize the slow motion feature, where time slows to almost zero and you can direct your heroes to an area and assign them a task to out flank, out smart and defeat your enemies! An RPG Party with up to Six Playable Characters. Build that classic RPG dungeon crawling group with our motely group of heroes. Each warrior can be outfitted with different equipment and specialized abilities to meet your needs. Allocating points in mind, body, control will build characters that fit your style or meet the challenges of the puzzles you will soon face. A Deep Crafting and Loot System. Collect hundreds of items. Combine over 100 different elemental materials in a unique crafting system designed to help you get more powerful weapons and armor.SYSTEM REQUIREMENTS Minimum: OS: Windows 7 Processor: AMD Athlon 64 X2 5200+ or equivalent Intel CPU Memory: 4 GB RAM Graphics: AMD Radeon HD5750 or nVidia GS 250 Hard Drive: 8 GB available spaceRecommended: OS: Windows 7 Processor: AMD FX 6350 or Intel Core i5-2300 Memory: 6 GB RAM Graphics: AMD Radeon HD 6770 or nVidia GTX 450 Hard Drive: 8 GB available space	© 2015 Tangrin Entertainment. All Rights Reserved.Copyright © 2015 Versus Evil LLC. All rights reserved. Versus Evil ® is a registered trademark of Versus Evil LLC.